It's time to go on a long adventure full of lots of walking and grinding on our way to catch the elusive Mew! If you are looking to catch the ever evasive Mew, then our catching guide will walk you through each of the steps necessary to complete this special research quest! 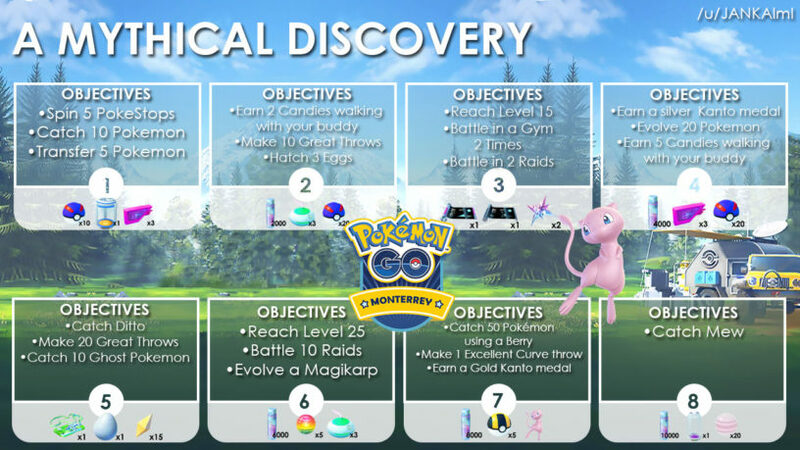 The Mythical Discovery Quest and its steps are quite long, but once you complete the journey you will get a chance to catch Mew. If you are seeking to nab yourself a Mew, just know that it's a pretty long process and requires quite a few steps. So, be sure you are ready for the long haul and have a big bag full of PokeBalls at your disposal. You'll also want to make sure you've invested in some comfortable footwear! What's Field & Special Research? Research tasks will provide interesting challenges that will help you get better at discovering, battling, and catching Pokémon! We're excited to see your contributions to the exciting field of Pokémon research, and we can’t wait to hear about the adventures you have along the way! Let’s get moving! It's time to take a look at all the steps required to catch yourself a Mew. We've got an image below displaying it if you just want a quick look at the steps, but below that I go into much greater detail on how-to better accomplish all of these steps and to catch this mythical Pokemon. Credit to JANKA_lml on Reddit for the image. Rewards - 10 Great Balls, 1 Incubator, 3 Lures! We're starting off very easy, all you will need to do is spin 5 Pokestops, catch 10 Pokemon, and transfer 5 Pokemon. This should be very quick if you are out just doing general Pokemon Go stuff for the day or during an outing. Rewards - 2,000 Stardust, 3 Incense, 20 Great Balls! We're getting a bit slower now, but you should be able to earn the 2 candies walking pretty fast as long as you use a low rank Pokemon. Magikarp is a good option if you have one because you'll likely need the candies for later. Making 10 great throws shouldn't be too hard if you are actively catching Pokemon during that walk. You will also want to have some eggs being incubated as well. 2km are going to be the fastest so start some of those up if you have them! Rewards - 1 Quick TM, 1 Charge TM, 2 Star Pieces! Reaching level 15 won't be a problem if you are already higher than that and have been playing for a while. Gyms aren't too hard to find, so this is another pretty easy step. Just head to a Gym you control and do a couple of battles. You don't have to win, just do a quick battle. You'll need to find a couple of Raids, but you only need to participate because victory is not required. Rewards - 20 Great Balls, 3 Lures, 4,000 Stardust! If you have been playing for a while, you've likely already earned yourself a silver Kanto medal. This will automatically be completed if that is the case. If you are just starting out, you will need to catch at least 50 different Generation 1 Pokemon for your PokeDex. Evolving 20 Pokemon can be a bit time consuming, but some players have reported having this auto-completed if they have already evolved that many Pokemon. If you haven't, it's best to go after the Pokemon that have multiple evolution and catching the earliest version of it. This won't require too many candies and the Pokemon are usually far more available. Finally, you'll need to earn 5 candies for walking your buddy. Just make sure you continue to walk your 1k buddy to quickly earn those candies. Rewards - 1 Premium Raid Pass, 1 Lucky Egg, 15 Revives! Now we're getting to the stages that are quite a bit more difficult. This one is pretty brutal, because catching a Ditto can be problematic. You'll need to catch a bunch of the Pokemon that have the potential to be a Ditto. Learn more about it with our Ditto Guide. Making 20 great throws isn't too terrible, but it's time consuming. The Ghost Pokemon can also be a slow one. You'll need to hope you are nearby an area that has a nest or spawns of them. You'll also want to try some night ventures as they are more likely to spawn in the later hours of the day. You can find spawn locations via the Silphroad Atlas. Rewards - 6,000 Stardust, 5 Rare Candy, 3 Incense! Reaching level 25 isn't a problem if you've been playing the game for a while, but you recent starters are going to have to play a lot of Pokemon Go to hit that level. 10 Raids isn't a big issue, but it can be a grind to completing them all. The Magikarp evolution is potentially problematic. The evolution takes a lot of candies, you'll need 400 of them to evolve a Magikarp and it isn't exactly the easiest Pokemon to find. Rare Candies will be helpful here, you can transform them into Magikpar candies. Also, don't forget to use Pinap Berries on the Magikarp to double the amount of candies you receive. Rewards - 8,000 Stardust, 20 Ultra Balls, A Mythical Pokemon Encounter! We're on the last steps now! Catching 50 Pokemon with a berry isn't that big of a deal, hopefully you've been stocked up on a lot of berries due to all the grinding. While you are catching those Pokemon, you can work on getting that one excellent curve throw you need for the second step. Finally, you will need to the Golden Kanto medal to complete this step. This requires you to have at least 100 different Generation 1 Pokemon in your PokeDex. If you've already done this, it will auto-complete! Rewards - 10,000 Stardust, 1 Super Incubator, 20 Mew Candy! You have made it all the way to the end and Mew is ahead of you! Now, all you need to do is catch it and claim your prize. I got mew not long ago, amazing stats, 78 IV isn’t much, but is it OK? mew got an amazing moveset.